compliment to our knitting. 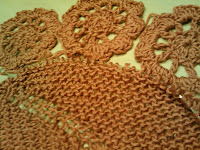 We learned all about the granny square .... and the many uses that are out there for this meager little creation. BUT, did you know that Granny's also got Flowers? Truth be told, Granny's got triangles and squares and flowers and just about any other shape you can imagine and/or crochet! I found these little flowers on the bottom of a Caron pattern and decided to give them a chance to see how well they would blossom! They are very portable and work up rather quickly so my collection is growing and i think i've found an interesting place to plant them! Row 2: k1, yo, k1, yo, k1. 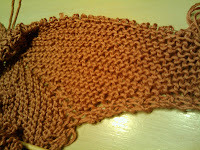 Row 3: k2, yo, k1, yo, knit to end. Row 4: k2, yo, knit to yo, yo, k1, yo, k to end. Row 5 to end: Continue the Row 4 formula until you reach the desired length/width. I'm going to have this one finish out at approximately 65 inches wide, being mindful that my medallions are approximately 4" wide (so that will equate to a knitted shawl of 56 inches wide). I'm also thinking about using the center of each medallion in the middle of my shawl pattern just to break up the garter stitch and create a bit of interest. There are so many uses for the gifts and talents and yarn we all have in our closet, or under our bed or wherever we may have it stashed. And in those moments when my heart longs to 'fix it' for someone who is hurting, my instincts are to share my heart through my knitting. Though i may not have walked in the steps of my friend, i know that i would want to share a hug and a prayer and a constant reminder that she is surrounded by friends who sincerely want to share in her journey. Simple? Sure. But sometimes the most precious gifts are those with no price tag but carry a treasure chest FULL of encouragement and memories and inspiration! adjust our perspective so we can better handle it all. Some people just see a ball of yarn .... you see a cotton washcloth! Some people just see a scarf .... you close your eyes and remember the cashmere as it was coming out of the skein, the pleasure of watching the 'perfect pattern' unfold beneath your needles and the contentment in knowing that the 'scarf' was created as a one of a kind gift! Some see sticks and hooks and string ... you have learned that it in keeping knit simple you have found a catalyst for your passion and an avenue for sharing your heart ... for all to see... one stitch at a time.